Prof Jane Gunn and Prof Doris Young were invited as guest speakers and participants at a health forum in Shanghai, China, along with colleagues from the Melbourne School of Population and Global Health and together with Victorian Government representatives from the Department of Health and Human Services. Jane was invited as a guest speaker and participant at the Shanghai-Victoria Health Roundtable. Organized by the Shanghai Municipal Center for Disease Control and Prevention and the University of Melbourne, the forum focussed on the theme, "Health Innovations to Improve Health Outcomes". The forum was at the Shanghai 6th People's Hospital, and senior members of the Hospital spoke to topics including “Innovations in the use of big data to improve health research and healthcare delivery”, “Identification of high and very high risk patients for cardiovascular prevention” and “Progress on prevention and control of non-communicable diseases in Shanghai”. Jane presented on “How can primary care improve the management of people who experience multiple chronic conditions?“ Participants shared the latest findings in the fields of technology and other innovations, intersectoral collaboration and health system reform, and capacity building and workforce training. The forum also looked at how developments in these fields can lead to stronger professional collaboration and improved health outcomes. 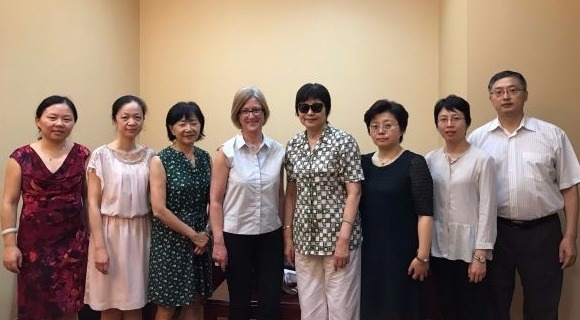 Jane and Doris also visited Zhongshan Hospital, Fudan University and met with academic GPs from the Department of General Practice and visted a community health centre.